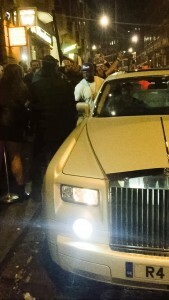 50 Cent arrives in Opulence! It’s not everyday an A-list celebrity from the US arrives into sunny Britain so it’s no surprise that East-Coast rapper 50-Cent, aka Curtis Jackson, chose Opulence Executive Travel on his recent visit to Newcastle as part of his Effen Vodka UK tour with the G-Unit. The award-winning star, who is set to release his long-awaited forthcoming album “Street King Immortal, was seen getting out of the Opulence Rolls Royce Phantom ahead of a night of partying at the city’s Tup Tup Palace nightclub.